Deadly fire has become more severe and almost commonplace the last few years in the US. In California’s North Bay alone during the fall of 2017, over 200,000 acres, 5,000 structures and 42 lives were lost to wildfires. All this in a span of about three weeks. Just a couple years ago, almost the entire community of Weed California, just north of Mt. Shasta went up in flames. Here are some interesting US statistics for fire risk. 45 million homes are built in areas designated as wildland/urban interface areas. This means 45,000,000 homes are at risk of being affected by a wildland fire. That is a lot. That amounts to about 100 million people. 72,000 communities are at potential risk from a wildfire. You or someone you know its likely living in a home in one of these areas. Do them a favor and share this page with them. Firefighters are some of the strongest, most dedicated and brave people I know, but once a massive fire gets going, they really can’t do much. They certainly can’t save every structure. So homeowners in these areas need to take action ahead of time to help reduce their risk. Good news is that unlike the massive, surprise destruction of floods, hurricanes, earthquakes and tsunami’s there are two affordable and fairly simple ways homeowners can make their properties safer and more resistant to fire. Embers are the most significant cause of home damage from wildfires. Most homes are ignited by flying hot embers and not from the fire itself. 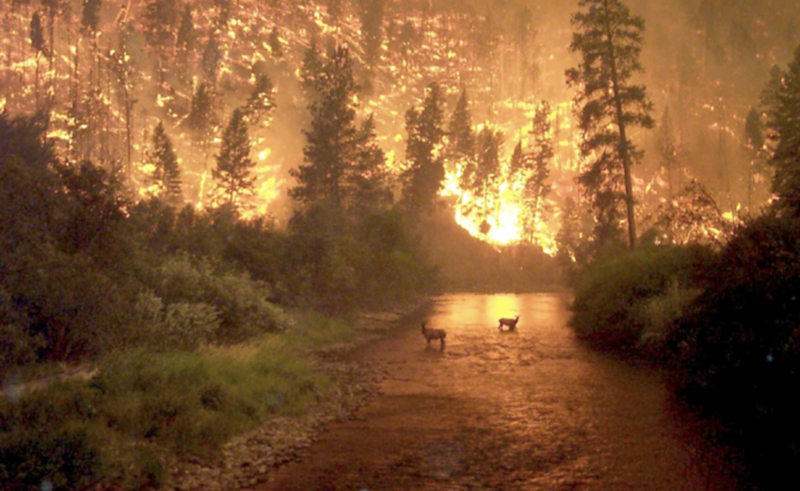 Embers from wildfires can be carried up to a mile from the actual fire. 1/8” metal vent screens over vulnerable openings can greatly reduce the risk or fire. Install a class A fire-resistant roof. Defensible space is an area that slows down an approaching fire and allows firefighters space and access to move around. California law says anyone who owns, rents, controls or uses a structure in the interface must create and maintain defensible space 100’ around the structure. Zone 1: 30’ out from structure remove any dead plants, branches or combustible materials and especially around and under decks/awnings. Keep trees trimmed, remove any overhanging your roof and keep them least 10’ clear of other trees. Choose only fire resistant plant species and keep them irrigated and healthy. Maintain regularly during the fire season. Zone 2: Extends from 30’ to 100’ out from structure, cut down any grasses to 4” or less, create spacing between shrubs and trees to prevent fire ladders to the trees. Clear all fallen leaves, needles, twigs, bark, cones and leave no more than 4” of leaf litter to act as erosion control IF needed. Zone 3: From structure out 100’, mow only before 10AM and never when windy or excessively dry, keep driveways clear for fire engine access. Ensure your address number is clearly visible day or night. Do not clear vegetation down do soil around waterways in order to protect from soil erosion. A fire-safe home requires a combination of fire-resistant building material, design features, fire-safe landscaping, and regular maintenance, especially during the fire season. Building materials and design features can be just as important as defensible space in the prevention of fire risk. Retrofitting your existing home is not mandated but these changes are highly encouraged and are required whenever the home is remodeled or re-roofed. Roofing: This is the most vulnerable part of your home. Roof with composition shingles, metal or tile. Gutters: Protect your gutters from the accumulation of debris and plant material. Use metal gutters only and keep them maintained. Siding: Replace with ignition resistant material such as cement board, plaster, stucco, masonry. Windows: Use double glazed or tempered glass to reduce the risk of fracture when exposed to heat. Limit the size and number of windows that face expanses of vegetation. Skylights: Use glass not plastic. Soffits and eaves: Enclose exposed facias, eaves and vents and ventilate the enclosures with metal screen 1/8”. Vents: All attic, basement and soffit vents on homes create openings for flying embers from wildfires. Cover all these with 1/8” metal screening. Protect vents in eaves, cornices or gables with baffles to block embers. Fire resistant vents are available. Chimneys: cover your chimney and stovepipe outlets with a noncombustible screen. Attachments: Anything attached to the home can act as a fuel ladder to the home. Room additions, decks, porches, carports and bay windows can be dangerous if made with combustible materials. Remove all vegetation and other fuels within five feet. Decks: Enclose the undersides of decks, overhangs and balconies with a non-combustible, fire resistant material and cover any openings with 1/8” metal screen. Never store firewood or lumber on or under your deck. Deck surfaces within 10’ of the main structure to be made of a non-combustible material. Maintain decks free of debris and non-fire resistant material. Design decks to avoid placement at the top of a ridge or hill. Fences: Do not attach wood fences directly to the main home as the fence can act as a fuel bridge. Attach the home to fences using a metal or masonry, non-combustible sections. Garage: Keep weatherstripping around the garage door intact and functional. Also, be sure the bottom of the garage door is sealed with a gasket material that fits tight to the driveway or slab. Keep all combustibles stored on shelves off the floor. Patios: To be constructed of ignition resistant materials such as concrete, masonry, tile or stone. Driveways: Maintain so that emergency vehicles can access your home. Gates must open inward and all overhanging trees cut back to achieve 13’-6” of clearance. Firescaping is landscape design that reduces a property’s vulnerability to wildfire. Less is better, leave plenty of space between plantings. Hardscape features like gravel paths and stone retaining walls that can block heat and catch blown embers. Careful placement of trees and shrubs can help reduce risk. Minimize evergreen shrubs and trees within 30’ of the structure. Use driveways, walks, patios, parking areas and mulch beds to create fire breaks. Keep tree canopies from touching each other and at least 10’ from power lines, chimneys and structure. Do not plant shrubs beneath trees. Maintain the landscape regularly and keep shrubs pruned and irrigated. This originally appeared on Home Preservation Manual.